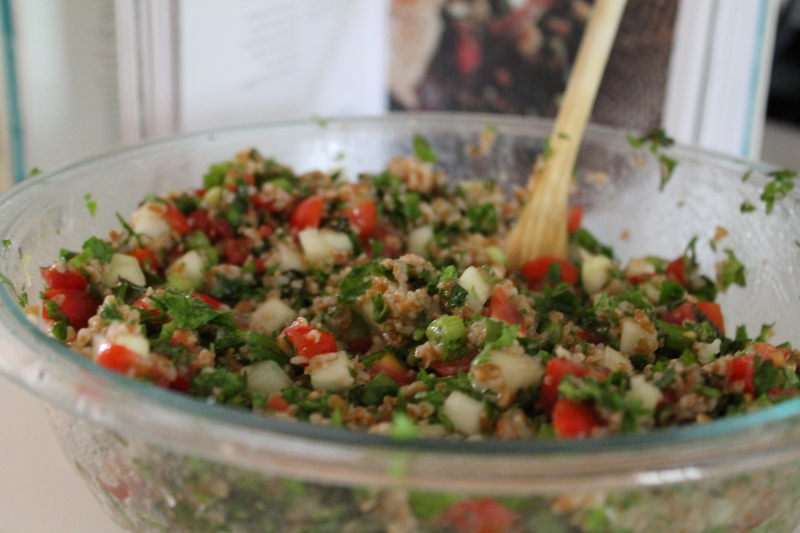 Okay, so tabbouleh always seemed a bit unbalanced to me. The overwhelming presence of parsley and cucumber, two things I tend to like only in small doses, was, well…overwhelming. 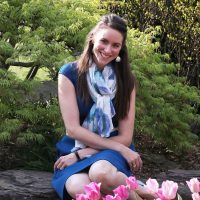 Sarah from Well Dined agreed with me. She didn’t like tabbouleh either. But somehow I convinced her we should try making it ourselves, and we came up with something that we both liked! Yes, it’s herby, but it’s also grainy and chewy with the extra dose of bulgur. We upped the tomatoes and added some garlic and thanked the heavens for scallions and…most of all…FETA CHEESE! This salad comes together pretty easily! 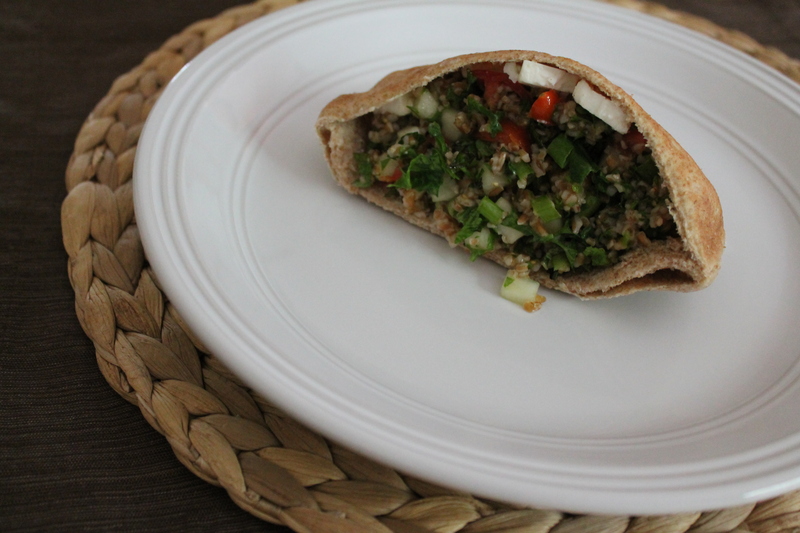 You don’t have to eat it stuffed inside of pitas, but if you have taste buds and hands (and a baby), then you will probably love it that way. 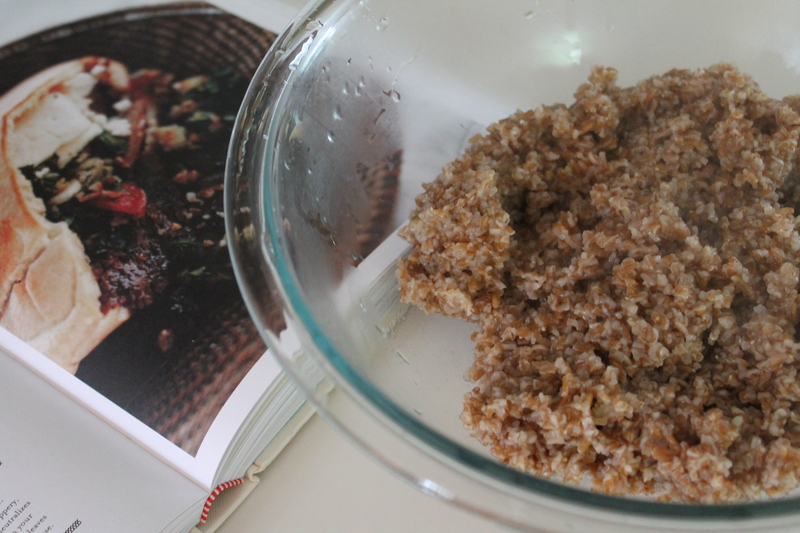 Start by cooking the bulgur. It cooks up pretty quickly, but don’t forget to stir it a few times. As soon as all the water is absorbed, press a clove of garlic into it and stir. The heat from the bulgur will mellow the sharp flavor of the garlic. 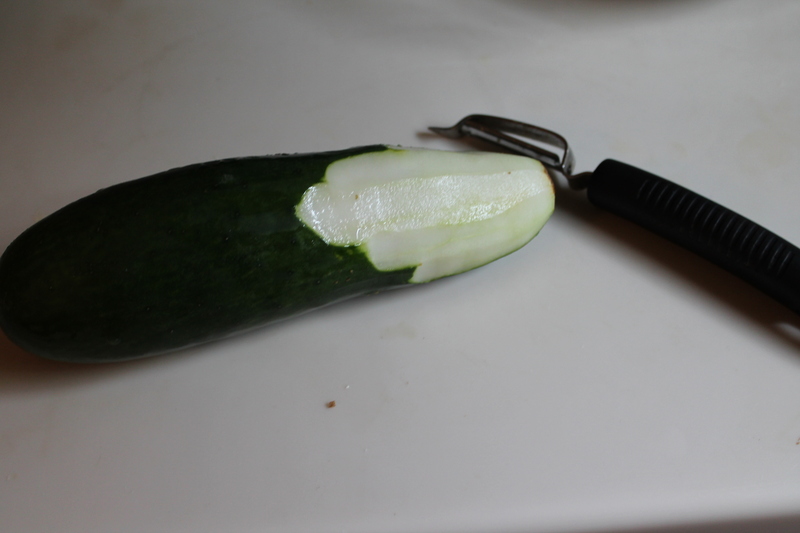 Meanwhile, peel and seed a large cucumber. Dice it up nice and small. Yes, this will take ages unless you have wicked knife skills (which I don’t). Good thing I had a good friend to help chop everything else and entertain my small fry! 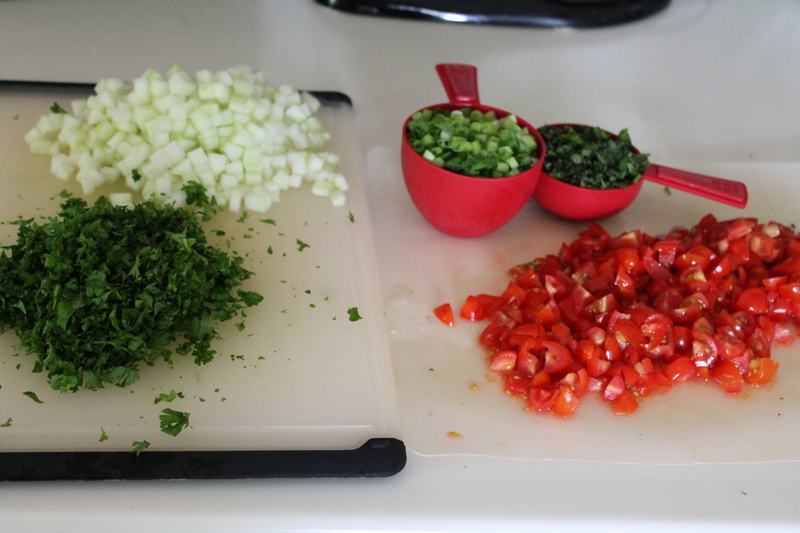 Dice up the tomatoes (we used cherry tomatoes and loved them) and finely chop the parsley, mint, and scallions. Toss the chopped veg and the bulgur together in a very large bowl. Make a little dressing of lemon zest and juice, olive oil, and sea salt. Drizzle over the salad and stir to combine. Mmm, pretty! Now, if you are planning to eat this the traditional way, you should definitely sprinkle feta crumbles liberally over the top before you dig in. Yes, I know that’s not traditional. Just do it. 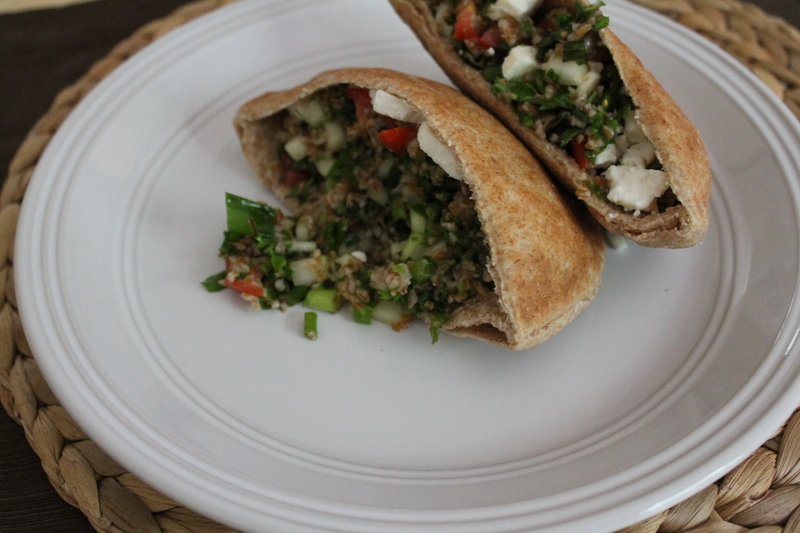 But if you are pulling together a a simple sandwich, then scoop that tabbouleh into a whole wheat pita pocket and layer in slices or crumbles of feta. Layer in some more. Maybe a scotch more. The sharp, briny feta is the perfect complement to the herby, crunchy tabbouleh. Rinse the bulgur. Cook in the water over medium heat for 12–15 minutes, or until soft and chewy. Remove from the heat and stir in the garlic. Drain of any excess water and transfer to a large bowl. Add the cucumbers, tomatoes, scallions, parsley, and mint. Toss together. Whisk together the lemon zest, juice, olive oil, and salt in a small bowl. Stir the dressing into the salad to fully combine. Serve cool, stuffed inside pitas, layered with feta to taste. Why do you use curly parsley rather than flat? Just curious. I find it changes the textures quite a bit. Honestly, I think you could use either! I typically go for flat-leaf parsley, because I think the flavor and the texture are both a little more to my liking. But…of the few times I have had tabbouleh, I remember curly parsley all through it. If you can’t stand the texture of curly parsley, go for flat! Cooking is all about making something the way you like it, right?